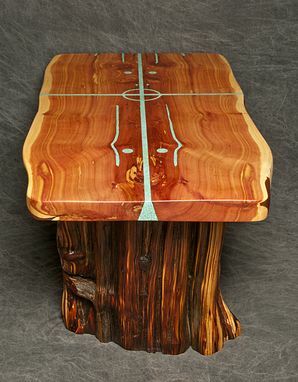 All parts to this table have been milled from local dead standing Juniper Cedar here in the Rocky Mountains of Colorado. The slab top is two pieces that have been book-matched to create a gorgeous mirror effect in grain pattern. 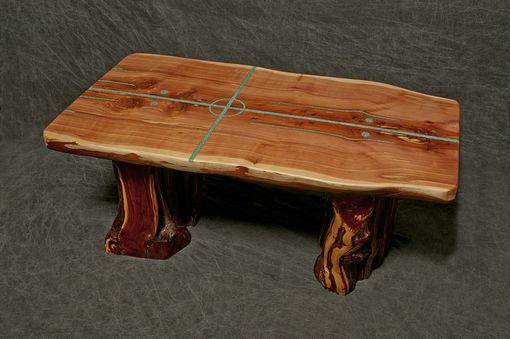 Half inch hardwood dowels have been used to join both slabs. 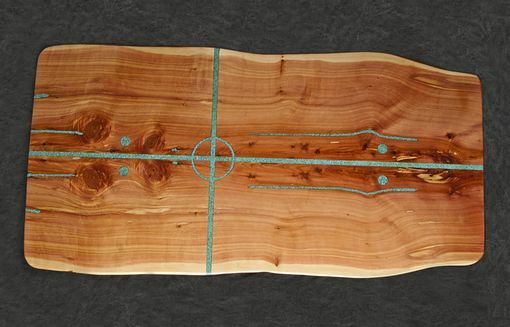 An intricate Turquoise Inlay has been done in alignment with the natural Grain pattern and the addition of the Four Directions Symbol makes this a one of a kind piece on Contemporary Southwestern Art. The fusion of Cedar and Turquoise are striking in contrast. Much time was spent finding elements with the proper symmetry. The effort paid off ! If you are looking for a truly unique piece that combines both function and art, this may be it. The finish has been done in approximately ten coats to give a deep Satin Luster. The legs have been mortised into the top slab. It is built to last for generations. 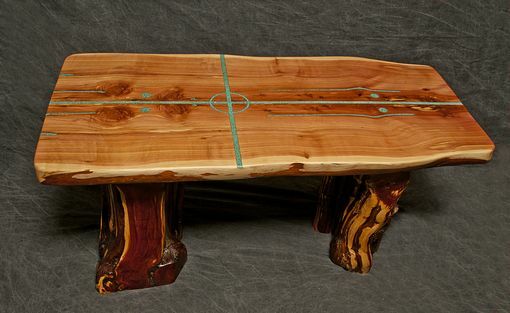 All edges are natural living edges.Table dimensions are approximately (there are natural variations) 46 " L x 23 " W x 19.5 " H.